Wolverine Caucus – Artificial Intelligence (AI): Where Are We, Where Are We Going, and What Should We Be Worrying About? Governor Rick Snyder was joined by Rep. Joe Graves (R-Linden), Rep. Kevin Hertel (D-St. Clair Shores), representatives from the business and non-profit community, as well as the members of the UM Unemployment Clinic commemorating the passage of the recent Unemployment Insurance Act overhaul. When Representative Joe Graves wanted to fix the Michigan unemployment insurance system that wasn’t working he called on the experts from the University of Michigan Law School Unemployment Insurance Clinic to help. 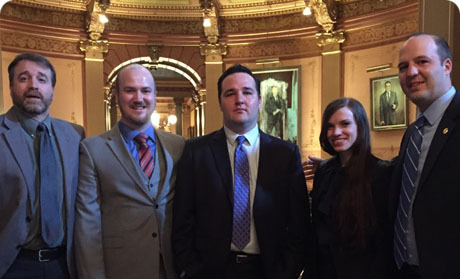 Rep. Graves assembled a bi-partisan workgroup that included Clinic Director and Clinical Assistant Professor Steve Gray and law student members of the MLAW Clinic. Seventeen members of the workgroup representing both employers, claimants and the Unemployment Insurance Agency collaborated to craft legislation to address problems with the existing system. In October 2017 eight bills were introduced to the Michigan House of Representatives. Two weeks later those bills passed the House with unanimous support. A month later those same bills unanimously passed the Michigan Senate. 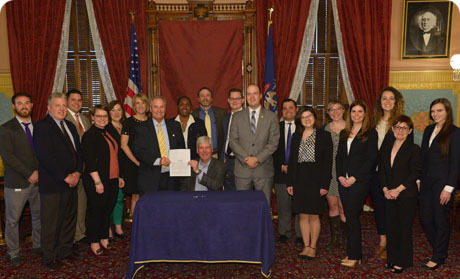 The legislation was signed into law by Governor Rick Snyder in December 2017. Professor Gray made note of the Clinic’s participation in the process. Professor Gray has proposed a policy clinic course for students. His proposal was approved by the University of Michigan Law School, and the course will be offered in fall 2018.